"KILLJOYS maintains its compelling storytelling and ability to leave viewers eagerly anticipating the following week's installment." Space announced today from Fan Expo Canada it has renewed its original series "KILLJOYS" for Seasons 4 and 5, ahead of its Season 3 finale. The two-season, 20-episode pickup will act as the final chapters for the fan-favourite Space drama. 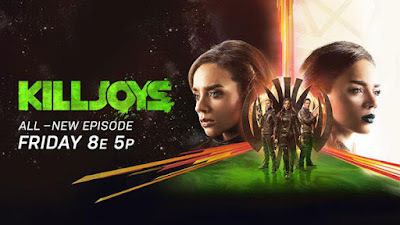 Created by Executive Producer Michelle Lovretta (LOST GIRL) and produced by Temple Street, a division of Boat Rocker Studios in association with Space and SYFY, KILLJOYS follows a trio of reclamation agents - or "Killjoys" - as they get pulled further into political turmoil and the deepening mystery surrounding the Quad system, despite their vow to never take sides. Season 4 is slated to begin production in Toronto in 2018. "KILLJOYS has been a jewel in the Space summer schedule and we are thrilled to deliver two more final seasons of this high-octane adventure series to a devoted audience," Pat DiVittorio, Vice-President, Programming, CTV and Specialty, said. "We have no doubt Lovretta, along with the incredibly talented trio of lead actors, will see this series through to a thrilling end." "A two season final order is a huge vote of confidence for a show that just keeps getting better and better," David Fortier and Ivan Schneeberg, Co-Presidents of Temple Street and Executive Producers of "KILLJOYS," said. "We are so proud of the reception and support KILLJOYS has had from critics and fans alike and are thrilled to be able to plan a deserving ending for Dutch, D'Av and Johnny. It continues to be an incredible intergalactic journey and we could not have wished for better partners to share the ride." "This is the kind of privilege every creator hopes for - a chance to plan the end of your tale with confidence, and the luxury of 20 episodes with which to do it right," Michelle Lovretta, Creator and Executive Producer of "KILLJOYS," said. "I'm immensely grateful that both network partners and Temple Street have given our team, cast, and fans this incredible opportunity." Reprising her lead role in the action-packed series, Hannah John-Kamen returns as Dutch, an audacious bounty hunter with a fierce dedication to her Killjoy family, on a quest to solve the mystery of her own identity. An undeniable rising star, John-Kamen is gearing up for a major breakout in the film industry with a series of upcoming must-see films, including the Tomb Raider reimagining (2018) and Steven Spielberg's film Ready Player One (2018). She has also joined the Marvel Cinematic Universe with her upcoming key role in the Ant Man sequel Ant-Man and The Wasp! (2018). Rounding out the lead cast is Aaron Ashmore as Dutch's loyal long-time partner John Jaqobis, the resident brain, mechanic, and pilot with a vulnerable heart and Luke MacFarlane as D'avin Jaqobis, a born soldier who's tactical skills and loyalty are as strong as his jawline. A Top 10 program on Space, and still its most-watched original series ever, Season 3 of "KILLJOYS" reached more than 600,000 viewers each week. Seasons 1 and 2 of "KILLJOYS" are streaming now on CraveTV. In the Season 3 finale, "Wargasm," (Sept. 1 at 8 p.m. ET on Space), it's go time. The Killjoy militia has gathered everything they need and are ready to go to war with Aneela and her Hullen armada, using Delle Seyah as bait. But as the battle begins, Aneela changes the entire game. "KILLJOYS" is created by Michelle Lovretta (Lost Girl, The Secret Circle) who also serves as Executive Producer. Executive producers are David Fortier, Ivan Schneeberg, and Karen Troubetzkoy. "KILLJOYS" is produced by Temple Street, a division of Boat Rocker Studios in association with Space and SYFY. Production Executives for Bell Media are Rebecca DiPasquale and Kathleen Meek. Tom Hastings is Director, Original Programming, Bell Media. Corrie Coe is Senior Vice-President, Original Programming, Mike Cosentino is Senior Vice-President, Content and Programming. Randy Lennox is President, Bell Media.